About five years ago I began collecting dead websites. 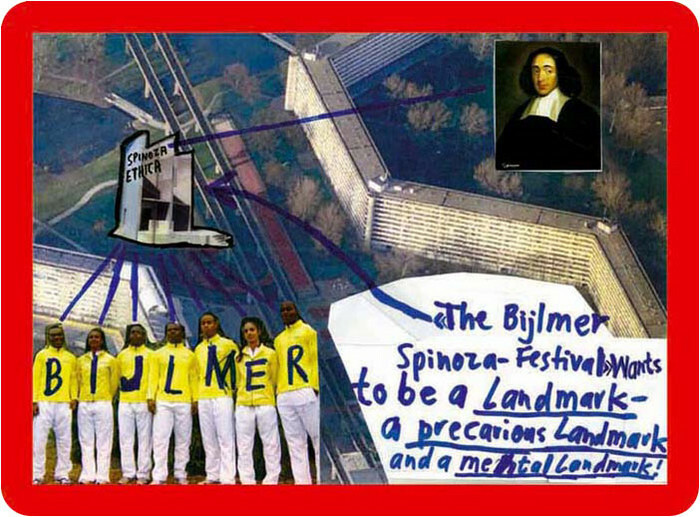 It started in 2010 with Thomas Hirschhorn, after his first website, made for the Bijlmer Spinoza-Festival in Amsterdam, disappeared from the net. The Spinoza project was the third in a series of temporary projects dedicated to philosophers. “Presence” and “Production” are terms I use for specific projects which require my presence and my production. It means to make a physical statement here and now. I believe that only with presence – my presence – and only with production – my production – can I provoke through my work, an impact on the field. 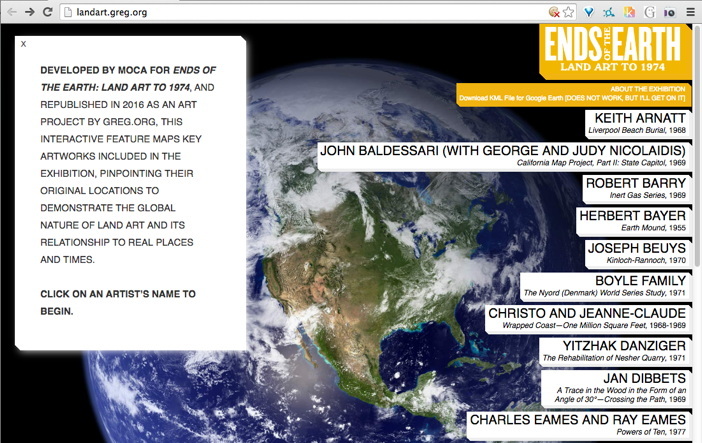 When the project is over, the programs end, the materials are dispersed, the artist moves on, and a couple of months later, the website where the entire thing had been documented disappears. Then the links go dead, the URL expires, and gets scooped up by some zombie ad network. All that remains are some jpgs illustrating Marcus Steinweg’s Bijlmer lectures. I’d been to the first at Documenta, the Bataille Monument, in 2002, but not the Spinoza Festival, and so the website was it for me. I’d wanted to read and see more, longer. And then I discovered I couldn’t. It was gone. 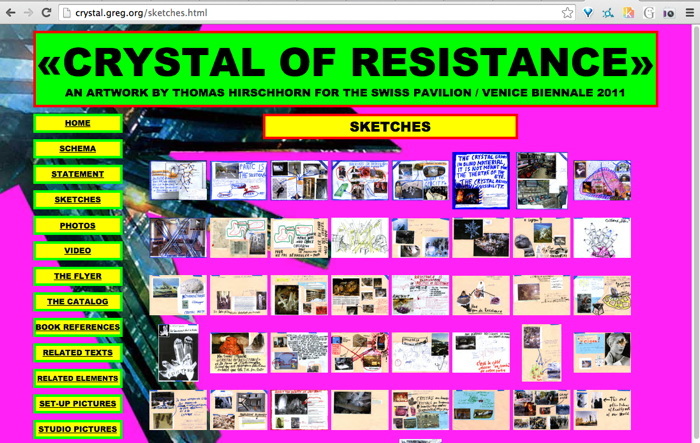 So when Hirschhorn launched his second website the next year, for CRYSTAL OF RESISTANCE, the Swiss Pavilion at the 2011 Venice Biennale, I was ready. Almost. I grabbed the whole site several times, but l missed some galleries. And then it was gone. The GRAMSCI MONUMENT site in 2013, I definitely got that one. And Hirschhorn’s project at the Palais de Tokyo in 2014, FLAMME ETERNELLE, I got that one too. When the greatest website in the world got edited into oblivion, I grabbed it from the Internet Archive and made a piece out of it last year: Untitled (Embroidery Trouble Shooting Guide). This is how I started posting them as subdomains, similar to found texts or found web objects. In the case of Hirschhorn, I was very aware since Venice that these were different, and very much not his work: “This website is neither an artwork, nor part of the artwork <>”, it said on the front of the site. But wasn’t, but now it was, but of a different work. Hirschhorn’s projects required his presence and his production, and my sites had neither. They appeared the same but were the opposite. They weren’t just for me anymore. At least I didn’t have to think so. Though it is still available on the Internet Archive, this is the kind of thing that should, I feel, exist within an art context. It is too off-the-cuff to imagine these two mirrors as a site and non-site, but that is an apt reference, I won’t throw it out. What ultimately motivates this repetition of the site is a bafflement at why MOCA removed it in the first place. Huge shoutout to Kim Drew (@museummammy) for calling this to my attention. I just feel like I have to grab these things, even the ones that get scraped into the Internet Archive. It’s an urge that I can’t dismiss, even when I can recognize the futility of it. I have to save them.